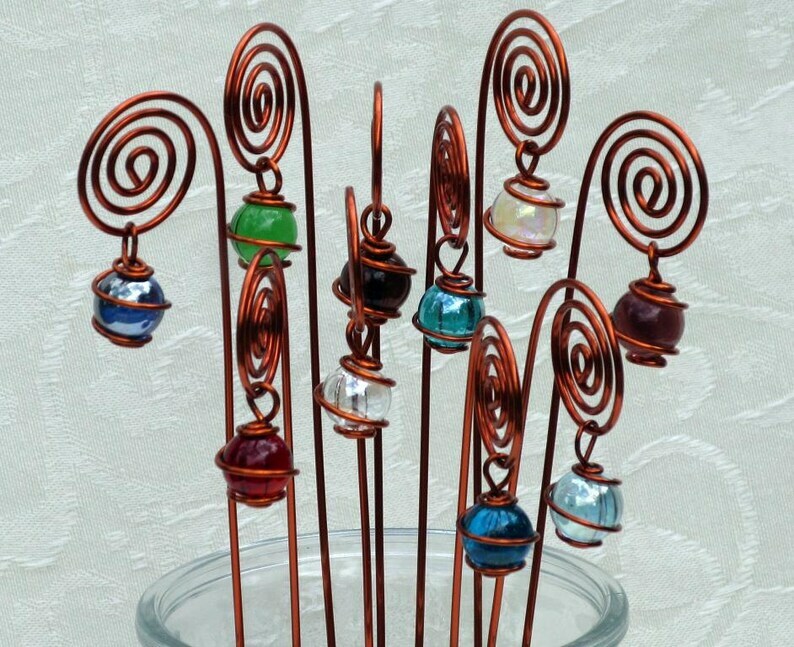 Each pick is twirled free form in enamel coated (to retard oxidation) solid copper wire. They are each accented with a different colored marble; dark blue, aqua blue, sky blue, red, amethyst, pale pink, amber, emerald green, teal and clear. Terrific as part of the centerpieces/favors for a bridal shower or to mark tables at the wedding. If you want them color coordinated to your event, convo me. I can do these picks in any combination of the colors shown plus, I have other marble colors on hand. I usually have in stock different shades of red, orange, yellow, green, blue and purple as well as clear, black and white. Some are crystal, some iridescent and others are opaque. Let me know what color you're looking for and I'll see what I have! Plus, Copper is the traditional gift for the seventh anniversary. Fill them with gift cards for an unforgettable anniversary gift. I am using these to decorate the centerpieces at my Father's 85th Birthday party. Thanks for all the wonderful Blue globes! Delivered fast!